So now we will have some fun revisiting yesteryear as we introduce our Greatest Clarkstown Memories Essay Contest for Reunion 2019. It's easy to enter, simply select one of the five categories below and write a short essay on the topic, anywhere from 100 to 1500 words (with no extra consideration for length) and forward your submission to Frank Eberling at frankeberling64@gmail.com (click on frank's e-mail or copy and paste it into your your e-mail address bar). Essays will be posted on Amazon.com. Submission deadline is September 1st, 2019. 5) A wild card: what reflection or observation about your time at CCHS have you carried with you to this very day. Frank has written his version of an essay to each of the five categories as samples to give you an idea what could be included in each category but please feel free to be creative if you have an idea for one of the categories that reflects your experiences at or from your years at CCHS. Frank's sample essays are below. Fifty-six years ago, on November 9, 1963, my father took a picture of me during closing moments of the Nyack game. I was waiting to get called back into my final football game. Under Coaches William Morrow and Bob Sawyer, we outsmarted them all. Center Charlie Pape hiked the ball to Bobby Lawson. Senior backfield included Pat Damiani, Bob Tveit, Keith Jones. Senior ends were Simon “Rocky” Levinson and the late Dave Forsberg. Tackles were Paul Hanchar and the late Frank Tucek. I played right guard despite my center #52. Underclassmen Michael Talaska, Glenn Handley, John Miller, the late Artie Connolly, Steve Bretschneider, the late Jimmy Munsing, Kenny Ward rounded out the team, with my brother, Ray Eberling, the team manager. After the final buzzer, the stands emptied out onto the field. My father rushed toward me and threw his arms around my shoulders. Doc Carney’s marching band marched through the streets of New City in celebrations, while many of us took off our pads for the last time. In recent years we’ve lost Artie Connolly, Frank Tucek, Jimmy Munsing, and Dave Forsberg. They were all heroes during that game. Through the inspiration of Coach William Morrow, we pulled off something many said could never be done. Has it really been 55 years? What follows is the article [that Frank wrote] from the Rockland Journal News, from November of 1995. Some minor revisions and updates have been made. In November 1963 we were unstoppable—champions on the football field, and ready to conquer the world. What a difference a month would make. When the ‘’63-’64 senior year began in a splash of brilliant autumn color, we knew we had all the answers. Within two semesters we were to discover how little we knew about ourselves, our friends, and the world around us. We lived in an “Ozzie and Harriet meets Norman Rockwell” painting, with our rosy cheeks and short haircuts, “Studyin’ hard and hopin’ to pass,” dancing to Chuck Berry and Motown, and enamored, even hypnotized, by a smiling president and his wife we saw on black-and-white television. Clarkstown High School was a different world than the one we live in now. There were no drugs in school. No racial turmoil. No malicious acts of rebellion or student violence. No teacher assaults. No all-pervasive sense of fear so prevalent in many of our nation’s schools today. That fall of 1963, we looked ahead to a year of promise and a future that held no limits. Most of us had known each other since kindergarten and there was no doubt in our minds that our senior class was the coolest to ever grace the halls of Clarkstown High. After an auspicious away victory over Goshen, we rolled over our opponents one after the other, despite incredible odds and the skepticism of sportswriters and county residents. It was just not possible for Clarkstown to defeat historical powerhouses like Suffern, Spring Valley, and especially Nyack. We succeeded in doing the impossible. Maybe we weren’t believing in ourselves, unable to figure out how it was actually happening. Bill Morrow and Bob Sawyer, our two coaches, seemed almost surprised themselves, until Coach Morrow did a little research in the Guidance Office and explained it all to us during our last practice session. “You’re not necessarily bigger or faster or stronger than your opponents, but you win because you are all a lot smarter than they are.” Coach Morrow had discovered, to his absolute amazement, that the team had exceptionally high IQs and the scholastic records to back it up. We beat Nyack that following Saturday. I made the most exciting tackle of my short football career. Bobby Lawson’s passes hit Dave Forsberg, Rocky Levinson, and Mike Talaska time after time. Paul Hanchar made a heroic, defensive goal-line stand three plays in a row, the likes of which I have never seen again. Victory was never sweeter, with a march down Main Street in New City and the celebrations that followed. The Class of ’64 was on a roll. That same victory week a former CIA/FBI informant was working at the Texas School Book Depository in Dallas. In Great Britain, the manager of a rock-and-roll group completed negotiations for four appearances on the Ed Sullivan Show. Most kids in the United States had yet to hear the band’s name or the sound of their music. And in a Far-Eastern jungle, a small contingent of U.S. Military advisors were training soldiers to fight a civil war that had been going on for decades. Surely, none of those things had anything to do with us. In a move uncharacteristic for me at the time, I had started keeping a journal that first semester of my senior year. Little did I know, this year would be like no other in history. As I read the yellowing, brittle pages now, the term “innocence” cannot really quite convey the spirit of that time. In a period of one month in that journal, we became football champions for the first time in the history of our school, I wrote of heartbreak when I broke up with a girl who would later become my first wife, we bowed in a standing ovation curtain call for the Senior Class play, our beloved president was assassinated, and The Beatles would change the sound of music forever. It was all a foreshadowing of the three decades of turmoil that followed. What we witnessed in a few short weeks would forever change our lives and the way we lived, in the way our country lived. It was if the world had suddenly shifted gears and lurched toward the future, throwing us off balance, leaving us grasping for something to hold on to, an anchor from the past that no longer existed. In six short months that followed, the world we lived in changed radically, and we changed with it. The story’s already been told in countless books and movies and songs of what happened next….of where we would go…of how we would change even more in the ‘60s and ‘70s. And where are the surviving cast of characters, 31 years later? (55 years in 2019). As for my teammates and other close friends, one of us committed suicide at the age of 19. One of us sacrificed his leg in the first war our country ever lost. Another committed suicide over a 20 years through drug abuse, another war we lost. Most of us now live in an average cross-section of American lives for a group of suburbanites in our late forties ( in 1995, early seventies in 2019). Vinny Burns took an early retirement from IBM and moved to Idaho. Charlie Pape tired of Wall Street early on and owned a very successful sports bar in Las Vegas. Jim Damiani became president of the Rockland Board of Realtors and a bigshot in the Rotary Club. Ken Conners made major motion pictures for many years. Pat Damiani and Bob Raspanti were electrical contractors. Simon, “Rocky” Levinson invents medical devices for the University of Colorado. (It was, no doubt, his IQ that skewed our team’s record). Richard Leibowitz is an attorney. Quarterback Bobby Lawson, whose golden arm led us to our championship season, is a retired FBI Agent. Paul Hanchar, the most determined defensive lineman I have ever seen play anywhere, became a high school teacher and later owned a bar in Congers, like his father before him. Sadly, teammates Frank Tucek, David Forsberg, Jimmy Munsing, and Artie Connolly have gone on ahead. Frank was a roofing contractor and David was a social worker with Native Americans in the northern mid-west. Artie owned a bar in New City. The 20th reunion was packed with exuberance and fun, loud music, and laughing. The 25th, still a good crowd, but perhaps a little more mellow, began with screams and hugs and ended with catch-up conversations that lasted until four the next morning. Our 31st reunion was held on Memorial Day of 1995. Where earlier reunions had brought elation, I left this one feeling let down. Maybe it was the fact that we were a year late for the scheduled “30th.” Maybe it was a bad choice of weekends. The crowd was smaller, almost subdued. Were we all just tired? So much older? The conversations were more strained, as if we had all run out of things to say to one another, had too many other concerns on our mind, or had just lost interest. Maybe the people many of us had traveled so far to see, had hoped would be there, never showed up. Bobby Lawson, our quarterback-hero turned FBI Agent, was too busy investigating the Oklahoma City bombing to attend. There’s a metaphor of our country in that fact somewhere, but that’s a story for another time. I searched the eyes of those few who did show up. Some came from as far away as Dallas and Chicago, or in my case, West Palm Beach. Why had they made such a journey after all this time? What were they looking for one last reminiscence to bring a smile of remembrance to their face? The retelling of a senior class prank, like the time we smuggled all the silverware out of the cafeteria over a few days? A forgotten twist on an old story they’ve told their own children a million times? To see someone they’ve known for 45 of their 49 years? I know why I went. Nothing very complicated. I wanted to feel again what was in my chest the day we left the field in triumph after the Nyack game. The school’s first 8-0 season. As the team walked off the field, our heroes carried on our shoulders, the strains of Doc Carney’s marching band played our victory song. Someone came running up behind me and threw his arms around me in a hug. In those days, no man hugged another, and I was embarrassed, until I realized it was my father. He was proud of me. He himself had been a 1933 graduate of Congers High School, Clarkstown’s forerunner, 30 years earlier. A few minutes later that day, standing in the locker room, I took off my shoulder pads for the last time and hung them in the locker. The simple rite of passage lasted but a second. Last Memorial Day weekend (1995) I visited the practice field and listened for the sound of cleats on the steps down the hill and the grunts of wind being knocked out of lungs on sudden impact of a helmet. But it was quiet. Below, a springtime sweet-clover had filled in the muddy spots worn on the field by a million cleats. I walked up the hill past the old Carnochan Mansion that served as the centerpiece of CCHS. Past the tennis courts, I half expected to hear Doc Carney’s lead trumpet solo on the Notre Dame fight song, customized for good old CCHS. There wasn’t even a whistle on the wind. Just the sound of a few memories clattering around in my head. I looked to the sidelines where my father had taken my photograph, had first hugged me. I waited for that feeling in my chest to come again. But like the field before me, it remained empty as I looked down from the hill. The time has moved quickly, and our world with it. So quickly we hardly even take notice. But for those of us who were there, the triumphs we lived, the sorrows that we field, the heartaches we overcame, the music that became our anthems; they will live on in the memories of at least a few of us from the Class of ’64. After graduating from CCHS in June of 1964, I spent the summer as a lifeguard at New City Park Lake. It was an unusual summer. My lifelong friends were disappearing from my life, one by one. My parents had purchased a home in Palm Beach County a few months earlier, with plans to sell the homestead on Main Street in New City. My father and grandfather had built our house for my mother and my father to start a family, in the days leading up to WW II. and stated emphatically, “Yes, you are going to college.” They wanted to move to Florida for several reasons, the primary one was that tuition for UF at the time was less than $200 per semester. As I worked my lifeguard job, my parents packed up the house and sold it, and for about six weeks we rented a house in Bardonia so I could finish my summer lifeguard job. What surprised me was my reaction to the enormous shock of moving away from the property where I had grown up and next to where my father had grown up. It signaled enormous change in my life that I was not prepared for. My last night in town, all the guys in my crowd went out for a night of partying. Not sure, but it was probably at The Wayne House, a bar in Stony Point that would sell alcohol to anyone who looked over the age of twelve. After, Vinny Burns drove me home to Bardonia and I thanked him for being like a brother to me. We shook hands. I would not see any of my friends for four months. I was walking away from New City and leaving my roots and my friends behind. It was not an easy thing to do. behind for a few more weeks to finish up his twenty-two year career at Lederle Laboratories. Two days later, on an early Saturday morning, my mother dropped me off at my University of Florida dormitory and headed south to our new home in Palm Beach County. I stood outside the dorm, which was not yet open, two suitcases at my side, and I waited, wondering what my new life would be like. I was not optimistic. Coming from a school of 900 students and a class of 264, many of whom I had known since kindergarten, I didn’t know how I would fit in on a campus of 18,000 students. I would soon find out I would not fit in. for new-student registration until 10am. I knew I was early, but I was growing impatient. I walked up to the only other kid, who was also waiting all by himself, suitcase by his side, with an awkward look on his face. Of course it was Brian Howell, who had moved to Florida after the first grade. His father had owned the ESSO station on Main Street. We talked until the dorm registration opened and promised to stay in touch. We never did. anymore. The acute homesickness began that first week and continued to get worse. The initial thing that happened was that everyone laughed at my New York accent. I was the one with an accent? Huh? In the Deep South? Please note that “Damnyankee” is one word, not two. black pointed shoes were not in vogue. Every guy, and I mean every guy, wore very specific clothing. Gant button-down collar dress shirts and slacks. Canterbury belts, Gold Cup socks, and Bass Weejun tassle-loafers. No exceptions at any time. End of story. The guys’ attitudes were one of rich, arrogant, entitled, fraternity boys. looked. But there was something missing. None of them ever laughed. Was it a Florida thing? A college thing? I didn’t know and I didn’t care. All the girls I knew back home laughed non-stop. That was what caught my attention. I wanted to hear these girls laugh. pages of text, per week. The other classes were almost as demanding. As an avid reader, it’s not that I couldn’t read the work, it was just that it was getting in the way of my novel reading. I was racing through the Steinbeck, Bellow, and Ian Fleming canons at the time. Why would I let my college assignments get in the way of The Grapes of Wrath, East of Eden, The Winter of our Discontent, The Adventures of Augie March, the James Bond books? No way. family had settled in New City in 1857, just before the Civil War, and growing up I had heard a million stories. It was my home and I was homesick to the point of serious depression. strangers and being subdivided into apartments. Part of my soul had been ripped out of my body. of guys had formed and they had become my support group; my family. I missed them and I missed all of my classmates. I missed old girlfriends. I missed my CCHS teachers. letters to everyone I knew. Football games, fraternity rushing parties, street dances, dorm parties, new friends, new girlfriends: I had missed them all. By choice. By design. How could they compare to the fun and friends I had experienced in New City? At CCHS? I was stuck in the past, stuck in New City, stuck at CCHS. I waited for the trimester to end and Christmas break to arrive. While other UF freshmen became acclimated to the changes and assimilated into their new community, I resisted the change and sulked my way through the first trimester. In reflection, the educational opportunities I rejected were vast. UF presented a great educational opportunity and I turned my back on it. Why? It wasn’t New City. It wasn’t CCHS. I wasn’t surrounded by friends or family. I was alone and hurting. I have often wondered if dormitory assignments were based on projected G.P.A. records and expectations. If so, they were correct. By the end of the trimester, my dorm section had the lowest G.P.A. on campus, with a 1.7 average. for the Christmas break to visit my parents and brother in Palm Beach County in their new home, I hopped a Greyhound bus and headed back to New City for Christmas. As we pulled out of the bus station in Gainesville, Downtown, by Petula Clark was playing on the radio. Manhattan. I was greeted by a carload of friends. Vinny, Charlie, Ken, Bob, Erich. Surrounded by friends, I was deliriously happy. I was home and things were back to normal. I would survive. The little inconvenience, aka “a college education,” was not going to interrupt the life I had known. No way. Or so I thought. Remarkable changes had taken place with all of my friends. For the next two weeks, I was regaled with all the stories about their new friends they had met at college or at their new jobs. I didn’t have much to report. They all seemed to have moved on in their new homes. They had adapted to changes I had not, and could not, seem to accept. I was stuck in the New City of my past. community, a great school with great teachers, you get spoiled and you take things for granted. Subsequent days and years pale in comparison because nothing can ever match up to what you’ve already experienced. And so for the next few years I resisted change, missed a million opportunities because I couldn’t let go of my home, my friends, my school, my memories. Sometimes one of them would say something silly in class and we would not be able to stop laughing the entire period. Class Play, The Man Who Came to Dinner. Kenny Barkin, truly one of the funniest guys I’ve ever met, took on the role of BANJO, a character based on Harpo Marx and portrayed on film by Jimmy Durante. During one performance, Kenny entered the stage. Charlie Pape and I, dressed in our police uniforms for our walk-on parts, watched from behind the curtains, off-stage right. As the scene progressed with back-and-forth banter between Banjo and another character, Kenny forgot his lines. There was deadly silence. You could have heard a pin drop as sweat formed on his brow. The audience eventually caught on and there were some nervous giggles as Ken stammered his way around through the obvious delaying tactic. Enter stage left, Chris Condura, in the role of a housemaid. She carried a tray in her hands and on that tray she had placed the script book, turned to the current scene. She looked at Ken and down at the script. It took him a split second and then a sigh of relief crossed his face. Reading from the page, he acted out his lines without looking up from the book on the tray. Everyone backstage was doubled over with laughter. Barkin, Richard Leibowitz, and I sat around a table played cards and reminisced. Most of us had been in the play or the audience that night of The Man Who Came to Dinner. We were once again privileged to hear Barkin’s great laughter. I almost expected Chris Condura to walk in the room wearing her maid’s outfit, carrying a tray with a script on it. This is a THANK YOU NOTE to both of you. Let me provide some context. complete my freshman year and dropped out in the spring of 1965. Four years later I eventually graduated and became a high school English teacher in Palm Beach Gardens for about five years. I tried to emulate the wonderful teachers I’d been blessed to have at Clarkstown. I looked around and observed carefully. Few of the dozens of teachers I worked with could measure up to what I had experienced as a student at Clarkstown. Through a truly bizarre set of circumstances I got a job at the local television station, and for the next eight years I was a television rporter/cinematographer/producer. After that, I went on to be a television entertainment magazine producer and eventually a documentary producer for a total of about forty-four years. I’ve done over 100 projects for the Armed Forces Radio and Television Service in places like Midway Islands, Pearl Harbor, Normandy Beach, the Bridge at Remagen. After that I did over 100 documentaries for Florida PBS, filming in thousands of locations around the state. Throughout these forty-plus years I have had the opportunity to sit down and interview four presidents of the United States, politicians, hundreds of sports figures, movie stars, celebrities, and authors. I have had the distinct privilege of rubbing shoulders with greatness on many levels. Why am I telling you all of this? To be a “name-dropper?” No. Over the years I tried to figure out if there was a common denominator that all of these achievers shared. Did they share any particular traits? They came from so many diverse backgrounds and levels of experiences and socio-economic classes. So what did all these people have in common? I could only find one trait all of them shared, and that was this. Not one of the hundreds of achievers I’ve interviewed had the slightest idea of the profound influence they’ve had on the lives of others. Not presidents, not politicians, not movie stars, not best-selling authors who had sold 90 million copies of their books. They did not, or could not, comprehend the influence they had over others. Coach Morrow, after a year of coaching by Lou Gerascioti, you took over, and we saw firsthand, the difference between truly terrible coaching by Gerascioti and truly great coaching by you. inspired us by your personal strength, not by yelling and screaming at us. It was grace under pressure and we all watched, absorbed, and learned how to conduct ourselves not only as athletes, but as honorable young men. opponents, but because we also outsmarted them with our intellect. the late, great, David Forsberg, Rocky Levinson, it comes as no surprise. And time has proven you correct in your assessment. As the season came to a close and our undefeated record seemed imminent, we closed ranks, followed your leadership, and awaited the last game. The Friday before, we all took a knee on the field, some of us for the last time. We listened to your final words. You convinced us we could do it. Football went 8-0 to win the championship. We lifted you on our shoulders, as you, metaphorically, had lifted us on yours. point. The bottom line is that you were responsible for making that happen, for giving our simple lives some lasting significance, and we thank you for it. In the coming days it was football championship jackets and trophies. (I still have both of mine after 55 years). Coach D’Innocenzo, my thanks to you for being a great history teacher and a great track coach. Tenth grade World History is one of those classes that has a significance you may not realize until later in life. My cousin, Margaret Rogers, had recommended that I take your class because you were a great teacher. I was fortunate enough to get in your class the following year. World History as a college requirement, I was light years ahead of my classmates because I had already learned the material from you four years earlier. As a track coach, you, again, coached through positive reinforcement. I remember starting the spring track training season running in the gym on cold, rainy, March afternoons. Later we ran out to the track for the requisite two laps before breaking into groups and starting specialty training. disbelief, as if to ask, “Why?” Not until later did I realize that by letting you down I had let myself down. A few days later I was walking home after school along South Main by the Esso station. I heard a bus honking its horn behind me and I turned to watch you and the team riding the bus, on your way to a track meet. You were taking the team to compete. I was going home to sulk. I knew then, for sure, I had made the wrong decision. I had let us both down. My senior year I came out for track again and you welcomed me back, despite the fact that I had quit the team a year earlier. You assigned me to run the 180-yard low hurdles and occasionally run the second leg of the 880-yard relay. I still have the newspaper clippings of each track meet’s event results, and an 8mm film clip that my sister took of me running the hurdles. It is surrealistic to watch it today. Your patience, forgiveness, and leadership went a long way with me, and I thank you for it. In the last few years I have cut back on the video production and have spent my days and nights teaching in the local state college classroom. Our world is different now and our students almost unrecognizable. It becomes immediately apparent that they did not experience the education in the classroom and the leadership on the athletic fields that we were fortunate to experience from teachers like you both. For that, I feel sorry for them. Not only for not being able to live in that age almost sixty years ago now, but also for never having lived in the environment our parents and our teachers provided for us during those special years. Are these merely the ramblings and reflections of a man of a certain age? I don’t think so. I remain convinced that we grew up on a special place, during a special era. You and your teaching colleagues helped make it special. And for that I am most thankful to you both. I’m sure most of the others have gone on ahead. Miss Hicks, Mrs. Korn, Mrs. Martz, Miss Palermo, Mr. Grider, Mr. Donn, Mr. Hanley, Coach McGrath, Miss Fitch, Miss Tuck, Mr. Roberts. They all deserve a special thank you. our perspectives, our futures, and our lives. The first time I danced to Glenn Miller was in the 7th Grade. The last time I danced to Glenn Miller was in the 12th Grade. I used to think we attended the best high school in the history of the universe, except for one small thing: the school dances. By the time we entered the 7th grade in the fall of 1958, Rock & Roll music had become a cultural phenomenon and was being integrated into our everyday lives, often despite resistance on the part of parents. Berry, the Del-Vikings and dozens of others. My older sister, Bonnie, an accomplished pianist an avid dancer, had taught me how to dance, with long afternoon practices, while watching American Bandstand. I learned The Lindy, The Stroll, The Cha-Cha through hours of practice after school. So when it came time to attend 7th grade dances in the CCHS cafeteria on Friday nights, I was looking forward to struttin’ my stuff to some good music. “What do they play?” I didn’t understand. Were they ignoring the most powerful cultural event that our generation had witnessed? “Music from the 30s and 40s. Big Band stuff. Swing music. Hence the name The Sophisticated Swingsters.” She didn’t really say “hence,” but you get the point. “You mean the stuff they used to listen to?” They meaning my parents. Frank Sinatra, Benny Goodman, Bunny Berrigan, Artie Shaw. They played the entire 30s and 40s catalog. I kept waiting for the Rock & Roll that would never come. The big novelty event of the night was the playing of The Bunny Hop. I had been warned about this tradition and how corny it was. How corny was it? Well, despite the fact that my father was a “colonel,” and that I was a little “husky,” it was still terribly corny. front of me while my waist was being held by the girl behind me, I mean, what’s not to like? hopped in the wrong direction at the wrong time, intentionally, almost toppling the lines over into a heap on the floor. Instead of “one hop forward, one hop back, one hop forward, three hops forward,” they would do “one hop forward, one hop back, one hop forward, three hops backward.” Boom! Chaos! I could Lindy to the fast songs Doc played, like In the Mood, or Chattanooga Choo-Choo, because those songs were danced to the Lindy a generation earlier. But it was the slow dances, like Moonlight Serenade, that really got to me. And so it was over the next six years I fell in love hundreds of times to the music of Glenn Miller, just as my parents had done over twenty years before, in those pre-War years. With my palms sweaty and my knees trembling, I would ask a girl to dance and hold her tight and for a few moments at least, fall in love over and over again. with on those nights and those three Glenn Miller dances. she caught me looking, I would avert my eyes quickly. But on that night of the dance, I asked her to slow dance and she said “Yes,” and I fell in love to the music of Glenn Miller for the first time, as my knees turned to black raspberry Jello. Four years later, in our junior year, there was another Sandra in my life. We were always laughing in class. I can still hear her laughter. In October I asked her to go to the Junior Prom with me that coming May. I got “Maybe” from her for the next five months. I would wait until the middle of each month and ask just one more time. I’m guessing the guy she was really hoping would ask her to the Prom had finally asked someone else, or had been killed in a freak skiing accident when an avalanche buried him under sixty feet of snowpack. Whatever. It was obvious from the get-go I was not her first choice. That night of the Junior Prom at the Empire Country Club in Spring Valley, I danced to another Glenn Miller tune, as played by Doc Carney and his Sophisticated Swingsters, and fell in love with Sandra #2.
the sounds of the Sophisticated Swingsters playing a Glenn Miller Christmas tune. Three Sandras. Three heart-throbs. Three aches in my heart I can never let go. All set to the soundtrack of Doc Carney and his Sophisticated Swingsters. I used to think I had attended the best high school in the history of the universe except for one small thing: the school dances and the music played by Doc’s group. Now I know I attended the best high school in the history of the universe because of school dances and Doc’s music choices. I once heard a rumor, later, that we couldn’t have Rock & Roll played at our dances because Mr. Festa didn’t like R&R. I’m not sure if the rumor is true, but I’m thankful for his decision. Who knows what would have happened if we had spent the night listening and dancing to R&R music at a high school dance? Would we have poured out of the school afterward in a Blackboard Jungle-like frenzy, stealing hubcaps and soaping storefront windows as we descended on an unsuspecting New City population, enroute to a career of juvenile delinquency? and all the other Sophisticated Swingsters for providing the soundtrack to our lives. back then, it might have been a century ago. Two of the Sandras have gone on ahead, years before their time. I talked to the third Sandra about ten years ago, but she had little recollection of the Christmas Ball. Every time I hear a big band tune, I think of Doc Carney, his great musicians, and my three Sandras, falling in love to the sounds of Glenn Miller (x 3). Playing music from 1935-1945 at our dances in the early 1960s made all the difference in the world. 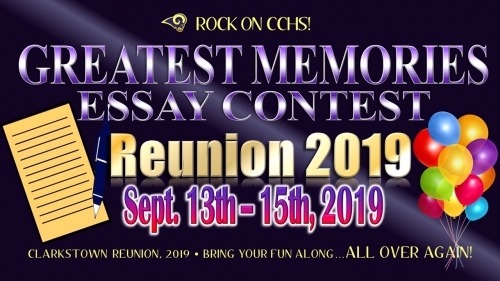 INVITE: So I hope some of these stories have piqued your interest to write something and attend the 2019 Reunion. Send all your entries in a WORD DOCUMENT to frankeberling64@gmail.com. Please put ESSAY CONTEST in the SUBJECT LINE. Don’t be reluctant to attend the reunion. No one cares what you look like or what you’re wearing. No one is playing one-ups-manship. We left that all behind during earlier class reunions. are,” as Billy Joel once said. Brothers and sisters, nothing like that matters. I personally am trying to figure out how to lose 400 pounds by September, but even if I don’t, I’m still going. I just hope my pimples clear up by then. from all ethnic backgrounds, religious beliefs, and economic levels. None of it ever mattered. Never. We started out in 7th grade coming from Street School, New City Grammar, Congers, Bardonia, Chestnut Grove, West Nyack. By the time we were seniors, the cliques had seemed to have melted together and we were all one family. That’s how I like to think of it. It’s not a class reunion, it’s a family reunion. was neither. Or both? I can’t remember. What was the question again?